FierceWireless reports that U.S. iPhone carrier partner AT&T is on track to deploy its "4G" LTE cellular network by mid-2011, with plans to cover 70-75 million people by the end of 2011. The carrier has also stressed that it is investing in significant upgrades to its 3G network to support interim service improvements and as fallback for customers who will not receive 4G coverage until later in the roll-out process. AT&T has said it wanted to wait for the LTE market to mature before moving forward with a full-scale deployment. Stankey said AT&T is working on a different kind of implementation for LTE than other carriers, and needs to carry forward its UMTS services to ensure that voice and data services can work simultaneously on both UMTS and LTE. The company is spending $700 million in capital expenditures on LTE this year and "will go far beyond that" in 2011, Stankey said. 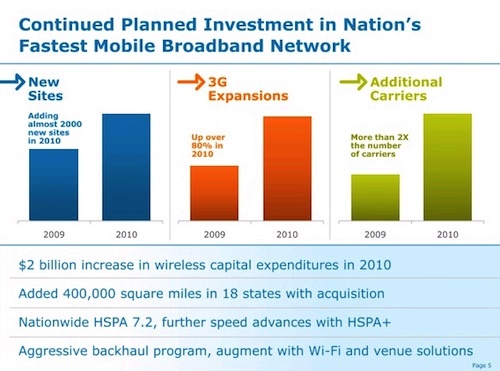 AT&T announced in January that it had completed upgrading all of its 3G cell sites to accommodate HSPA 7.2 data speeds but that upgrades to backhaul connections were required before the carrier would actually be able to support the higher speeds. AT&T reports that it continues to deploy the backhaul upgrades around the country to support that effort. 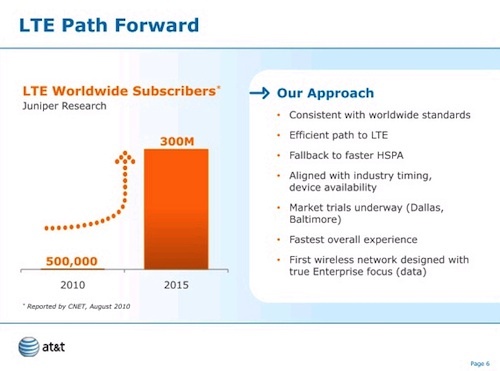 But even beyond HSPA 7.2, AT&T is also pushing forward with HSPA+ on the way to 4G. HSPA+ technology will reportedly allow AT&T to offer real-world speeds of 7 Mbps, considerably faster that the real-world speeds offered under the HSPA 7.2 standard still rolling out now. AT&T announced in February that it had partnered with Alcatel-Lucent and Ericsson to provide equipment for its LTE network, and the carrier appears to be sticking to its planned schedule of a significant 2011 launch for the technology.